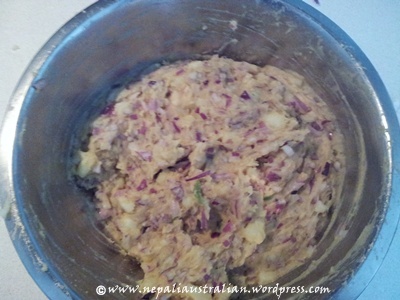 Aloo means potatoes in Nepali and this is a simple Nepali vegetarian dish. Boil the potatoes (use pressure cooker if you have one) and make a mash after peeling off the skin. Add chopped onion, chillies, ginger, garlic, lime and salt and mix well. Make sure the mixture is a bit lumpy and not too smooth like a paste. 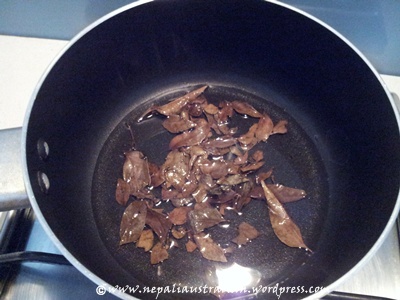 Heat two spoon oil and add the mustard seeds and curry leaves. 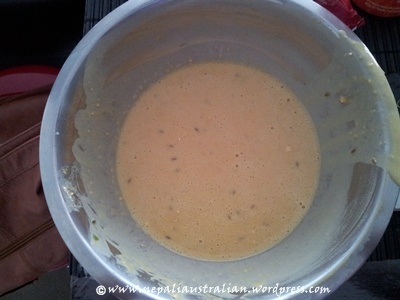 When the mustard crackles, remove from heat and add to the potato mixture and mix well. In one bowl, make a batter from gram flour and baking soda. Add salt to taste, cumin seeds, red chilli powder and turmeric powder. The batter should not be runny and should remain a bit thick. Divide the potato mixture into equal sized portions, in the size of small egg. and make a flat disc shape. 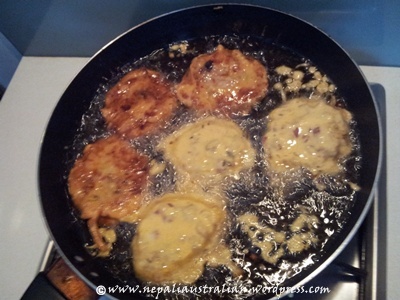 Dip each disc in the batter and deep fry till golden brown in colour. 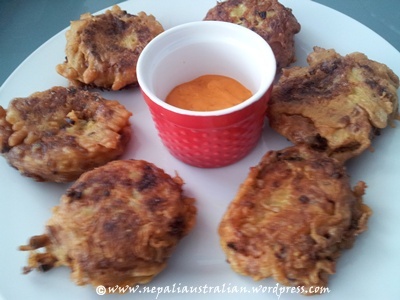 This entry was posted in Foodie, Nepali food, Recipe and tagged aloo chop, Nepali dish, Nepali vegetarian recipe, potato chop, vegetarian, Vegetarian recipe. Bookmark the permalink. Mmmmm… Looks delicious! I loved the food I ate in Nepal. Especially the dal bhat and curried potatoes with rice. I miss it! So much healthier than our western food. Looks pretty tastey, definitely something I’ve never tried! Oh goodness. This makes me nostalgic too. Thanks for the recipe. I’ll have to use it sometime soon!